From the depths of space…it came to be guessed at! 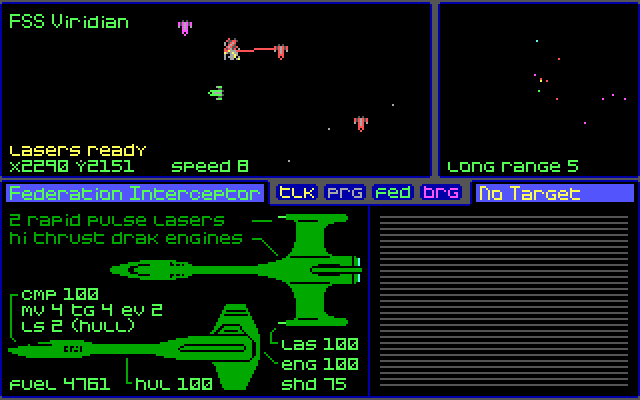 Yes, it’s yet another incredibly obscure space RPG. Name and developer, please! Your reward will be a pin with six angels dancing on it. ~ by Anthony Salter on February 26, 2008. Looks like Sentinel Worlds I: Future Magic made by Electronic Arts. Is that it? I was hoping you would mention Karl Buiter as the developer, since he did the game practically by himself. But you are technically correct – the best kind of correct! Of course, now that means I have to get six angels to dance on the head of a pin…which could take a while. Personally, I haven’t had much of an opportunity to play this game. I did check it out for about 10 minutes, maybe I’m just spoiled by more modern games like Fallout and Halflife. I couldn’t get past the user interface. I’ll probably try again when I have some real uninterrupted free time, after I beat Phantasy Star. I have heard really good things about this game and since I did play and finish Wasteland, I should be able to beat this one. One man game makers are pretty cool. There were quite a few back in the 80s. What other games did Karl Buiter make? He’s been doing quite a lot apparently. The other one he is most widely known for is Hard Nova…but not much after that, unfortunately.